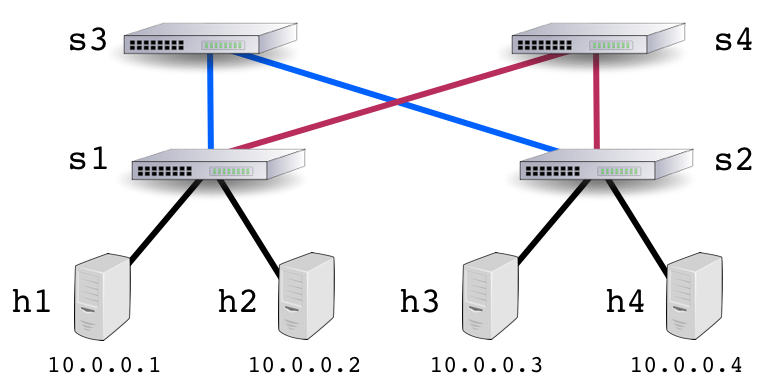 This article develops a script for automatically detecting large flows that can form the basis of a load balancing performance aware software defined networking (SDN) application. The script is based on the node.js DDoS mitigation example presented in Controlling large flows with OpenFlow. Here the script is adapted poll sFlow-RT every second link loads as well as receiving large flow events. The script tracks total bytes per second on each link using packet sampling since this gives a low latency measurement of link utilization consistent with the flow measurements, see Measurement delay, counters vs. packet counters. The link load values are stored in the links hashmap so they are available when deciding if and how to re-reroute large flows. 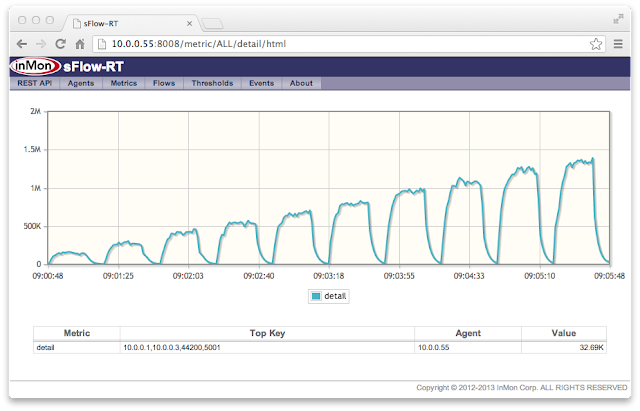 The flow keys used in this example are ipsource,ipdestination,udpsourceport,udpdestinationport in order to detect the flows generated by iperf. However, any keys can be used and multiple flow definitions could be monitored concurrently. 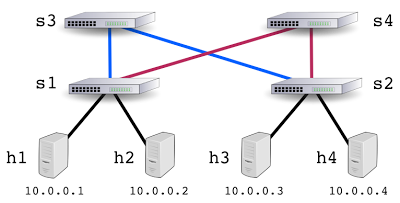 The threshold is set so that any flow that consumes 10% or more of link bandwidth is reported. The function largeFlow() simply prints out the large flows. However, given a network topology and the link utilization data, this function could be used to implement flow steering controls. Note that each flow is detected on ingress by all of the links it traverses as it crosses the network (the blue path shown in the figure below). Detecting each flow on all the links it traversed gives the controller end to end visibility and allows it to choose globally optimal paths. In this experiment, having multiple independent agents report on the flows provides useful data on the spread of detection times for each flow. The relatively slow time to detect the 10% flow results because the threshold was set at 10% and so these flows are on the margin. If a lower threshold had been set, they would have been detected more quickly. For flow sizes larger than 10%, the detection are between 1 and 2 seconds for flows in the range of 20% - 40% of bandwidth and detection times for larger flows is consistently sub-second. These sampling rates allow a central controller to monitor very large scale switch fabrics. In addition, multiple control functions can be applied in parallel based on the sFlow data feed, see Software defined analytics. For example, implementing load balancing, mitigating denial of service attacks and capturing suspicious traffic as SDN applications. The load generation script prints out a timestamp each time a flow is initiated and the flow detection script prints out a timestamp when a large flow threshold event is generated for each link across the network (3 events). The range of results is the spread of times for the first and last link to detect the large flow (obtained by subtraction the event and load generation timestamps). when I run this script, error is " require is not defined",, How can I fix it? can i get any tutorial to learn this code..
For node.js there are a number of suggestions on StackOverflow How do I get started with Node.js.